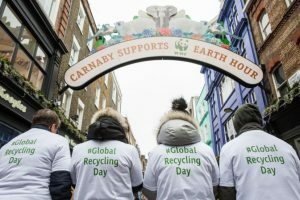 The first-ever Global Recycling Day was launched across the world between the 15-18 March 2018, with a flagship event taking place with the Day’s founder on London’s Carnaby Street. The initiative from the Bureau for International Recycling (BIR) calls on the world to think “resource” not “waste” when it comes to recycling. Global Recycling Day representatives were stationed at a recycling pop-up on Carnaby Street to encourage the public to sign the petition to get the Day officially recognised by the United Nations, and to ask for a more global approach to recycling. Recycled textile bales were positioned at the pop-up to highlight the scale of collection with one of the world’s most iconic fashion destinations making the ideal backdrop. In attendance was the founder of Global Recycling Day, and President of the Bureau of International Recycling, Ranjit Baxi, as well as Victoria Rabin from Westminster City Council and Alan Wheeler from the British Textile Recycling Association. Outside of London, Global Recycling Day hosted events in Paris, Sydney, Dubai, Delhi, Johannesburg, Washington DC and Sao Paulo and witnessed off-shoot organic events in Ulaanbaatar, Mongolia; Mustang, Nepal; Jaipur, India; Abuja, Nigeria and Athens, Greece to name but a few. Thousands of participants took part in litter picks, educational programmes, community events, petition signing and more. Photos and videos have been uploaded and shared in their hundreds across social media using #GlobalRecyclingDay and #SeventhResource. Alongside the events, Global Recycling Day has received an outpouring of support for its petition https://www.change.org/p/save-the-planet-support-recycling – asking for the United Nations to officially recognise the Day and promote the importance of a global approach to recycling in order to protect the future of our planet. Currently reaching over 7,200 signatures, the team has set new goals to hit 7,500 by the end of the week. Social media support also continues to grow. Global Recycling Day has now nearly 18,000 followers across Twitter and Facebook. Some of the biggest brands and names on the planet joined in the celebrations for Global Recycling Day across social media using #GlobalRecyclingDay to raise awareness of recycling, the circular economy and even create their own mini-campaigns. Some of these global brands included: Dell, Nestle Waters HQ, UNIDO, Veolia, L’Occitane, C&A, Greenpeace, Tetrapak, WWF EU, Coca-Cola EU Dialogue, DEFRA and Fjällräven. Environmental leaders, academics, politicians and UN organisations also pledged words of support for the inaugural day, with names including Dr Therese Coffey, UK Minster for the Environment DEFRA; Anne Hidalgo, Mayor or Paris and President of the C40; Rolph Payet, Executive Secretary of the Basel, Rotterdam and Stockholm Conventions; Erik Solheim, Head of UN Environment; Christiane Dolva, Fjällräven Sustainability Manager; Nikhil Seith, United National Assistant Secretary; Dr Yaakov Garb, Lecturer at Ben Gurion University of the Negev; Scientia Professor Veena Sahajwalla of the University of New South Wales; Dr Aldous of Thomson Ecology and Stephan Sicars, Director Environment Department UNIDO (United Nations Industrial Development Organization). Sponsors, partners and supporters include: Sims Metal Management (Founding Sponsor); ISRI and FEDERC (National Association Partners); Fjällräven (Marketing Partner); VDM, BDSC, BVSE, BMRA, IICA and BRM (supporting National Associations) and City of Westminster Recycling and Carnaby Street (Partner). 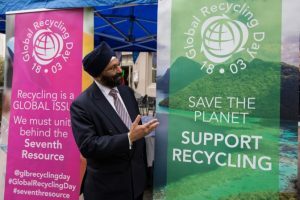 Ranjit Baxi, President of BIR, said: “The support that we have received in our first year for Global Recycling Day has surpassed all our expectations and underscores just how ready the world is to prioritise recycling and the ‘Seventh Resource’. “The volume of people who have taken part in the special events across the globe, pledged support for our petition, and joined in the conversation on social media has been phenomenal. Global Recycling Day aims to educate and gather support for a global approach to recycling and the results that we have seen from year one have truly set us on that path. Not only are we recognising the great work the recycling industry does, but we are showcasing this to key policy makers and influencers around the world, and of course to the public at large. We are truly seeing a shift in how people value the ‘Seventh Resource’. Global Recycling Day (18/3) is an initiative of the Bureau of International Recycling (BIR). It is the brainchild of Ranjit Baxi, who announced his vision for a day dedicated to recycling at the inauguration of his Presidency at BIR’s 2015 Dubai Convention. BIR is the global federation of recycling industries, representing the interests of the recycling sector worldwide. The first Global Recycling Day took place on 18 March 2018, also the 70th anniversary of BIR. The aim of the first Day, and all subsequent Days, was to unite people across the world, highlighting the need to conserve our six primary resources (water, air, coal, oil, natural gas and minerals) and celebrating the power of the ‘Seventh Resource’- the goods we recycle every day. The vision and mission of Global Recycling Day is set out in its Seventh Resource Manifesto, which can be downloaded here.